Anyone who has played a Civilization title, especially Sid Meier's Alpha Centauri, should feel right at home with Pandora: First Contact. The premise is basic enough, but still holds true to the themes established by Civilization games over the years. Explore a new world, research and improve your populace and attempt to ferret out opposing factions using diplomacy, science or military might. All in all, Pandora: First Contact is a solid if unspectacular title that is a visual upgrade over the much older Alpha Centurai, but does not quite deliver as much depth as I would have liked. 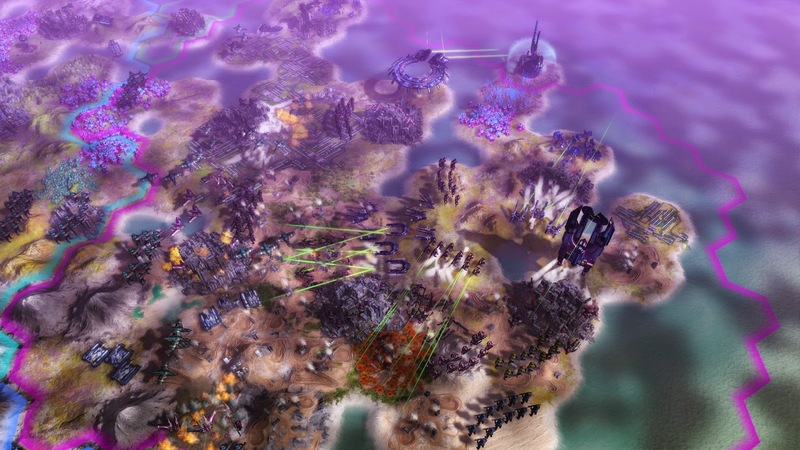 There is a comfortable familiarity to Pandora: First Contact, as I have play several Civilization games over the years and absolutely loved Civilization V when I reviewed it. 4X turn-based strategy games are incredibly hit and miss with me. Sometimes they absolutely click and I find myself sinking dozens of hours into them, trying all sorts of different methods of developing my would-be empire. Other times I can find them to be so dense, with such a high learning curve, that I struggle to really get into them, finding the early experience to be a chore that my interest never quite recovers from. Thankfully Pandora: First Contact falls into the former category, as it was easy to pick up and play. I was met with my share of disasters early on as I roamed the landscape and wound up butting heads with various forms of alien life, with those skirmishes generally ending very badly on my part. Still, once I found my groove initially, I was enjoying the process of building up my cities and expanding my borders. At least until my first interactions with rival factions. The diplomacy aspects of Pandora: First Contact were among the first things I really struggled with initially. Despite a variety of dialogue options, I almost always felt like the conversations turned out the same. People would encounter my faction, make demands that would almost completely bankrupt me, and my failure to comply would lead them to come after me with unrelenting military attacks that I would hold off until a second or third faction would inevitably join in and finish me off. There are a fair number of options for creating new games, including map size, AI aggressiveness (though frankly, they just always seem super aggressive no matter what I have this set to), whether or not to make the world random and more. I generally found the larger maps to be more agreeable, giving every faction a bit more space to build the way they prefer. If the maps are too small and the different settlements too clustered, it feels like the military-heavy factions have an early advantage. 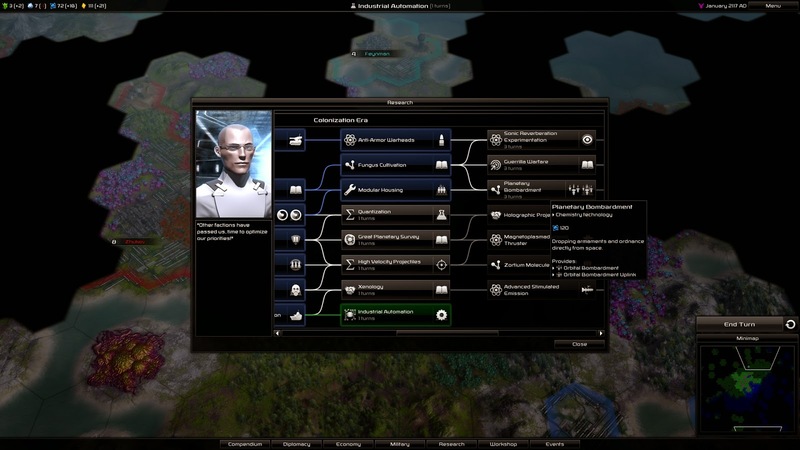 These are pretty standard in a 4X game like this, but one key item I really liked about Pandora: First contact was the randomized tree of technical upgrades. This might not sound like a big deal, but it keeps new matches feeling a bit more fresh since there is no specific build for maximum success every match. As the technology evolves, so do your units. Instead of simply calling them different names with different stats, you can actually customize your unit builds, equipping them with different kinds of armor, weaponry and technology. It does feel as though Pandora: First Content is more heavily focused on military might over the other types, which is in alignment with the hostile alien world atmosphere. Barbarians are seldom a threat in the Civilization games, but here crossing paths with aliens can prove incredibly dangerous. 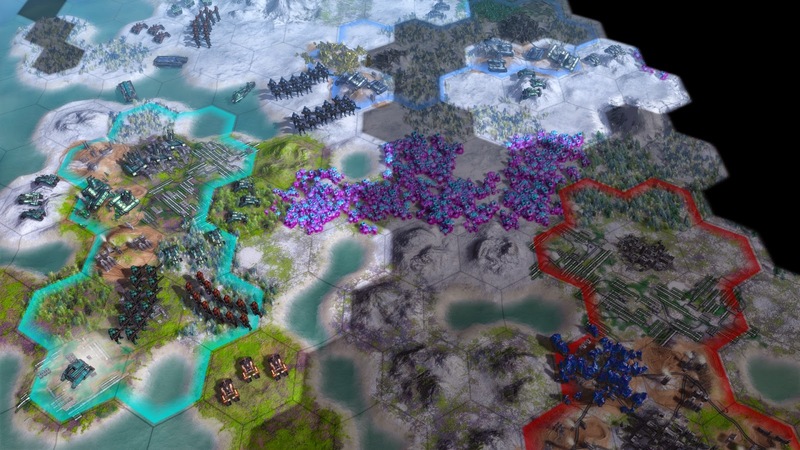 Early on they will generally ignore you and allow your units and cities to go about their business. As the game progresses however, the element of hostile alien threat becomes a more prominent danger and actually adds a distinct flavor to how Pandora eventually plays out. The presentation is enjoyable overall, with good music, decent sound effects and pleasant, colorful visuals. There is a real otherworldly feeling to the background music as your units traverse a world filled with exotic aliens, colorful fungus and landscapes that yield precious resources. It is also worth noting that the UI is easy to get around once you get used to it. The tips are helpful early on, but do not fully explain all of the menus. Once you get the hang of them though, I found it very quick and easy to progress from turn to turn effectively. More dynamic events at the end of the game, a slightly better sense of balance to the play styles and more overall content would really help to raise Pandora: First Content over many of its 4X peers. Luckily what is here is still quite good, and I had a great deal of fun playing it. Easy to recommend if you are looking for something similar to Alpha Centauri, but different enough to appreciate for its own merits.